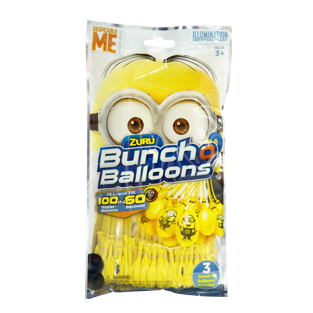 Combining Bunch O Balloons award winning technology with Universal's Minions to bring to you the ultimate Minion mayhem item! 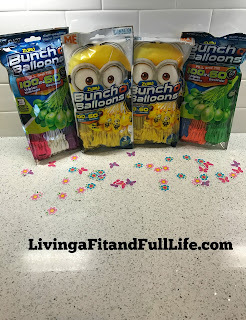 Simply connect, fill and tie hundreds of water balloons and let the Minions mischief begin! 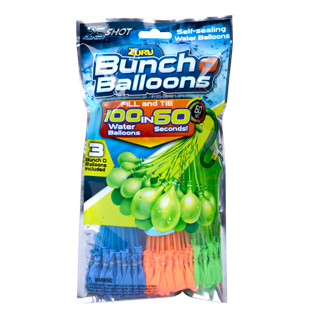 Fill and tie 100 water balloons in less than 60 seconds with ZURU Bunch O Balloons! Oh my gosh, if you're still filling water balloons the old fashion way then you absolutely must try ZURU Bunch O Balloons. Once you try ZURU Bunch O Balloons, you'll never go back to filling and tying balloons one by one again. I was blown away at how quick and easy it was to fill and tie 100 water balloons. I simply let the air out of the water hose, connected the hose while the balloons were in a tub of water, filled and pulled up quickly. As soon as I pulled up quickly I had 100 water balloons ready to go. As the mom of four kiddos this has to be the quickest way ever to fill water balloons and is sure to make a warm summer day a day your kids will cherish forever!